A. E. Hull Pottery was founded in 1905 in Crooksville, Ohio, initially producing stoneware. By 1907, Hull Pottery had already expanded by adding a second plant and had grown to employ over 200 workers. By 1920, Hull was producing a wide variety of quality stoneware, planters, and art pottery, incorporating new airbrushed and blended glaze techniques. They also produced items for the bathroom and kitchen which usually had a white semi-porcelain body. After the stock market crash in 1929, much of the production shifted to tiles although other items continued to be produced as well. 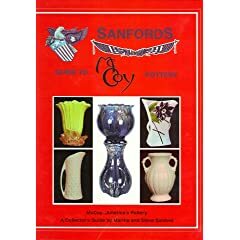 In the 1930s, Hull capitalized in the growing interest in art pottery and introduced several lines of matte finish, pastel, and floral items in the shape of vases, planters, ewers, and bowls, most in varying sizes. Their most successful items were the Little Red Riding Hood cookie jars which were patented in 1943 and began an entire new production line of figural kitchen and novelty items which continued well into the 1950s. Although best known for their pastel matte glazed ware, some of the lines were high gloss. 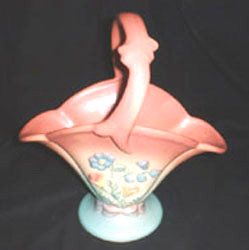 Rosella, glossy coral on a pink clay body, was produced for a short time only; and Magnolia, although offered in a matte glaze, was produced in gloss as well. The plant was destroyed in 1950 by a flood which resulted in a devastating fire when the floodwater caused the kilns to explode. The company rebuilt and equipped their new factory with the most modern machinery. However, it was soon apparent that the matt glaze could not be duplicated through the more modern processes, and soon attention was concentrated on high-gloss artware lines such as Parchment, Pine and Ebb Tide. Figural planters and novelties, piggy banks, and dinnerware were produced in abundance in the late 1950s and 1960s. By the mid 1970s, dinnerware and florist ware were the mainstay of their business. The firm ceased production in 1985. Buy period Hull, Weller, Roseville, Rookwood, and other finer art pottery on the Collectics Pottery and Fine Antiques pages, or search the entire site for great antiques, collectibles, and crafts for every collector!